PHOTO: Before Excimer Laser Long teeth and exposed roots with marked tooth sensitivity. 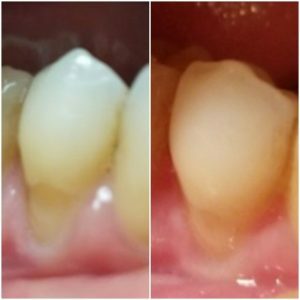 AFTER PHOTO: 3 WEEKS POST 3 EXCIMER LASERS : about 30-35% shortening of exposed roots, improved gum line, and marked reduction in tooth sensitivity. Tooth Decay and Gum Disease: It’s a natural part of being a human. But when the gums get inflamed, recede, bleed, result in permanent tooth loss, and the root is exposed, it’s one of those things that a good many of us want to control. One of the first symptoms of gingivitis is tooth sensitivity. Here, we’re tackling tooth sensitivity and toothless-ness, what to do when you are battling periodontal (gum) disease, and how to naturally reverse gingival disease without breaking the bank or undergoing painful gum surgery or tooth implantation. New, safe, and totally painless laser therapies called Excimer Laser (308 nm) and other Low Level Laser Therapy (LLLT) are readily available to help advance the gumline, decrease bacterial film, and decrease inflammation. Often patients will first notice a decrease in inflammation around the gums, and second a regrowth of the gum. The first phase of laser therapy is called Regeneration and Repair, and the second phase called the Maintenance mode. While not everyone responds the same to laser and light therapies, excimer laser has been exceptional in many individuals with rapid gum response. Other mechanisms yet to be understood. Having strong white teeth in most cultures is associated with perceived attractiveness, youth, and an appearance of general well-being. Worldwide, people spend billions of dollars on dental products, toothpastes, mouthwash, breath sprays, gum, and breath mints, and last but not least, dental care and dental surgeries The American Dental Association (ADA) estimates that the national expenditure on dental expenditures was approximately $124 billion dollars in 2016, up from $120 billion dollars in 2015. It is estimated by Advantica, a dental claims administrator, that Americans spend $2 billion dollars annually on toothpaste, mouthwash, toothbrushes, and floss. According to a 2014 ADA report, the average American dental patient spends over $650 out of pocket annually on dental services. That number is significantly higher for adults 65 and older, closer to $800 per year. Globally, the toothpaste market is estimated to reach $27.7 billion dollars annually by 2023. Periodontitis is extremely common as adults age. A study entitled “Prevalence of periodontitis in adults in the U.S. for 2009-2010 estimated that 47.2% (or 64.7 million) American adults have mild, moderate, or severe periodontitis. The more severe the periodontal disease, and if left untreated, can lead to complete tooth loss. Several recent studies including one published in 2018 in the International Journal of Cancer studies have suggested that periodontal disease is associated with increased rates of cancer and cancer mortality, especially of the pancreas, breast, and esophagus. Additionally, other studies have showed an association with increased rates of of heart disease, and Alzheimer’s. A study published in the Journal of Periodontology in April 2011, suggested than women were twice as likely as men to have received a dental checkup in the prior year, and women were more likely to schedule the recommended treatment following dental evaluation. The study also showed that women had better periodontal health, through lower rates of dental plaque, calculus (hard buildup) and bleeding on probing. Men are more likely than women to have periodontal disease, and all comers over the age of 70 have a very high rate approaching 60% of disease. Since the grind of gum disease and tooth decay is typically unending, it’s important to start treatment as soon as your teeth start bothering you. Gum recession and inflammation or “periodontitis” describes inflammation of the tissue surrounding the base of the teeth and gums. This may lead to thinning or loss of gum tissue, and exposure of the tooth root. Periodontitis may be caused by a number of factors including smoking, inadequate oral hygiene, internal illnesses (autoimmune conditions), genetic predisposition, and other bacterial film conditions, or nasal colonization with Staph and other bacteria. Traditional therapies have ranged from scaling and planning, invasive and often painful gum surgery, gum transplantation, and most recently combination of lasers and scaling using various lasers like the Nd-Yag. Best practices in periodontitis likely should include a general dental exam, typically screening dental x-rays, and measurement of probing depth at your consultation, before starting excimer therapy. The most natural or holistic programs may use “photobiomodulation” which is a combination of light and/or low level laser therapies including Excimer lasers. This is an overall gum recession and thinning without specific bone loss or decay. While this type of gingivitis may not be noticeable to others, often the individual will feel their teeth are sore, particularly temperature sensitive to cold, and not as strong or healthy as they previously were. Sometimes people who have gum disease and early tooth loss, start noticing tooth sensitivity, not realizing that the gums are heavily or rapidly receding. A close look at the gum line reflects that the dental enamel is exposed causing areas of heightened sensitivity. Whereas gum transplant surgery and surgical gum line advancement can cost upwards of $8000-$10,000, these new non-invasive and safe laser gum disease therapies average $250-$400 per session. Individual responses vary as with any laser or light modality. 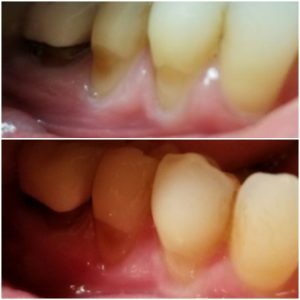 on average patients with moderate gum disease may have anywhere from 5 to 25 weekly laser treatments for regeneration, and then maintain for a reasonable time with monthly or bimonthly touch ups. Excimer laser is very safe, fast, and completely painless. An entire mouth and gum line could be treated in under 5 minutes in the office setting. There are absolutely no needles or anesthetics required. Hence, even a small child could easily have excimer laser or LLLT and feel nothing.